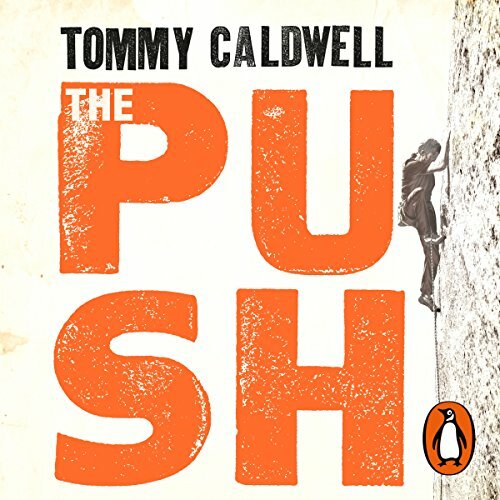 Penguin Audio presents The Push by Tommy Caldwell, read by Johnathan McClain. On January 14, 2015, Tommy Caldwell, along with his partner, Kevin Jorgeson, summited what is widely regarded as the hardest climb in history Yosemite's nearly vertical 3,000 foot Dawn Wall, after 19 days on the route. Caldwell's affinity for adventure then led him to the vertigo-inducing and little understood world of big wall free climbing. But his evolution as a climber was not without challenges: in his early 20s, he was held hostage by militants in a harrowing ordeal in the mountains of Kyrgyzstan. Soon after, he lost his left index finger in an accident. Later his wife and main climbing partner left him. Caldwell emerged from these hardships with a renewed sense of purpose and determination. He set his sights on free climbing El Capitan's biggest, steepest, blankest face: the Dawn Wall. This epic assault took more than seven years, during which time Caldwell redefined the sport, found love again and became a father. The Push is an arresting story of focus, drive, motivation, endurance, and transformation, a book that will appeal to anyone. I couldn’t stop listening! A fantastic book for climbers and non climbers as well. As a climber though I found it captures every essence of what it is to be a climber. impressive and very captivating story about incredible commitment to the project in life of Tommy.